A REZ Report – American Indian Reservation that is. The Basketball Success Story of two sisters and their mother – of a reservation in Eastern Oregon. Far From Reservation, Sisters Lead Louisville. 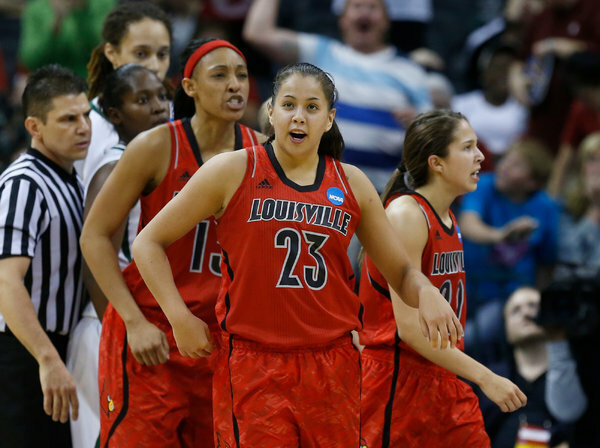 Shoni Schimmel (23) with her sister Jude, right, during Louisville’s win over Baylor last Sunday. Louisville then defeated Tennessee to reach the Final Four. OKLAHOMA CITY — Louisville had just advanced to the women’s Final Four, and the sisters Shoni and Jude Schimmel had helped cut the nets in celebration, a rare achievement for American Indian athletes. But it was not the biggest family news of the day. Shoni Schimmel leads Louisville in scoring at 14.4 points a game. As the sisters left the court Tuesday night, their father beamed and their mother waved and flashed her wedding ring. After 25 years of companionship and 8 children, Ceci Moses and Rick Schimmel had been officially married, inspired in part by Louisville’s epic run through the N.C.A.A. tournament, a mother’s deferred dream realized and an accomplishment by her daughters that was as much a cultural triumph as an athletic success. Although basketball has long been the most popular sport on Indian reservations, seldom has that esteem translated into great performance in the highest college and professional ranks. An N.C.A.A. study indicated that during the 2011-12 academic year, only 21 women and 4 men identified as American Indian/Alaska Native participated among the 10,151 basketball players at the Division I level. The Schimmel sisters, who belong to the Confederated Tribes of the Umatilla in eastern Oregon, are not only participating, but also have become indispensable members of Louisville’s team. Shoni Schimmel, a 5-foot-10 junior guard, leads the Cardinals in scoring at 14.4 points a game and has seemingly unlimited range on her arcing 3-point shot. Jude Schimmel, a 5-5 sophomore, is the team’s steady sixth man. While Jude is quietly reliable, Shoni is a florid passer with a brash on-court personality. She twice scored more than 20 points and was named most outstanding player of the Oklahoma City regional as Louisville upset Baylor, the defending national champion, and Tennessee, which has won eight N.C.A.A. titles. On Sunday, Louisville (28-8) will face California at the Final Four in New Orleans. Through Shoni’s influence, in particular, the Cardinals have adopted a more structured version of what many call Rez Ball, an up-tempo style that is joyful, feverish and fearless. For Tuesday’s victory over Tennessee here in the regional final, Indians from numerous tribes came in support, holding up signs that said “Rez Girls Rock” and “Native Pride” and “Never Give Up.” Many said they viewed the Schimmels as an inspirational counterpoint to the despair of poverty, alcoholism, teenage pregnancy, drug addiction and educational indifference often found on reservations. Depending on the region of the country, 30 percent to more than 50 percent of Indians do not graduate from high school, according to various studies. And many who do leave for college often feel pressure to return in a culture that finds comfort at home, and fear and suspicion in the outside world. Basketball serves a passionate communal purpose and provides an objective measure of success against the bleak statistics of failure on reservations, said Don Wetzel Jr., who operates the Montana Indian Athletic Hall of Fame, founded by his father. Stories abound of cars ringing makeshift courts at night, lights on, boundaries marked with flour, players honing their ball-handling skills by wearing gloves or dribbling over rocks. As Shoni entered her junior year of high school and Jude her sophomore year in 2008-9, however, the family left the Umatilla Indian Reservation in Mission, Ore., for Portland. Moses, now 40, began coaching her daughters at Franklin High School. Rick Schimmel, now 44, who is white and played baseball briefly at Stanford, became the assistant coach. Shoni Schimmel in the documentary film “Off the Rez,” directed by Jonathan Hock. Some relatives resisted, but the move was necessary, Moses said. Her own basketball and track career had been disrupted in high school, she said, when she gave birth to her eldest son at 15. Later, she had to settle for basketball at community college, Moses said, because her coach seemed reluctant to promote Indians to university recruiters. For her daughters, Moses planned a different outcome. To help them gain exposure, they would play at a city school and showcase their talents against top-flight competition. Urged by her mother not to limit her college possibilities to the West Coast, Shoni chose Louisville in 2010. The Cardinals had reached the national championship game in 2009. They average 9,500 fans a game and have a coach, Jeff Walz, who cultivates a flamboyant, frantic style that suits her. He also provides what she considers a family-style atmosphere. During inevitable periods of homesickness as a freshman, Shoni even baby-sat for Walz’s two children. Still, Shoni can be a challenge to coach. She leads the team in assists (127) and turnovers (123). In a tense 82-81 victory over Baylor last Sunday, Schimmel made a sublime and maddening play at the same time, dribbling behind her back, flicking a blind shot over the 6-8 Brittney Griner, then screaming at Griner and risking a second technical foul. Kim Mulkey, the Baylor coach, complained that the referees had lost control and let the game become too personal among the players. Shoni shrugged and said her barking was just an exhale of emotion. She apparently is not the only family member who acts on the spur of the moment. On Tuesday, the couple married in a chapel near the county courthouse, records indicate. Their daughters could not attend because of a shoot-around practice. Hours later, after Louisville defeated Tennessee and their parents debated whether to drive to New Orleans and the Final Four, Shoni and Jude greeted about 30 Indian fans who had waited for the team bus. August 9, 2010 is The WORLD INTERNATIONAL DAY and as a first – The UN Headquarters will be home to an INDIGENOUS PEOPLES film-making festival as in “We the Peoples” protecting cultures. The International Day of the World’s Indigenous People will be observed at United Nations Headquarters and around the world on Monday, 9 August 2010. This year’s observance will highlight indigenous filmmaking, celebrating the contributions of indigenous filmmakers to promoting greater understanding of their communities, cultures and history and the challenges they face today. The work of indigenous filmmakers “connects us to belief systems and philosophies; it captures both the daily life and the spirit of indigenous communities,” states Secretary General Ban Ki-moon in his message for the Day. At the UN Headquarters event in New York, remarks by the Secretary-General and other UN and indigenous representatives will precede the screening of four short movies by indigenous filmmakers. After the film screenings, a discussion with three indigenous filmmakers will be moderated by Reaghan Tarbell, from the National Museum of the American Indian (see full programme below). In his message to mark the Day, the Secretary-General emphasized the major contribution of indigenous peoples to global cultural diversity. “The world’s indigenous peoples have preserved a vast amount of humanity’s cultural history. Indigenous peoples speak a majority of the world’s languages, and have inherited and passed on a wealth of knowledge, artistic forms and religious and cultural traditions,” he stated. The United Nations Declaration on the Rights of Indigenous Peoples, which was adopted by the UN General Assembly in 2007, underscores indigenous peoples’ right to maintain, protect and develop the past, present and future manifestations of their culture in various forms including the technological, visual and performing arts. MEDIA ARRANGEMENTS: Journalists without UN accreditation who wish to attend the event should follow the instructions for obtaining accreditation at www.un.org/media/accreditation For media enquiries or interviews, please contact: Renata Sivacolundhu, Department of Public Information, tel: 212-963-2932, e-mail: sivacolundhu@un.org. For Secretariat of the Permanent Forum, please contact: Broddi Sigurdarson, tel: 917 367 2106, e-mail: IndigenousPermanentForum@un.org . Monday, 9 August, 2:00 – 5:00 p.m. This event is organized by the Secretariat of the United Nations Permanent Forum on Indigenous Issues DSPD/DESA, and the NGO Committee on the International Decade of the World’s Indigenous Peoples. The International Day of the World’s Indigenous People is officially commemorated annually on 9 August in recognition of the first meeting of the United Nations Working Group on Indigenous Populations in Geneva in 1982. General public wishing to attend the observance should register by Thursday 6 August, by sending an email with full name at: indigenous_un@un.org. Please note that those who have not registered will not get a day pass, and will thus not be able to attend. Holders of valid UN grounds passes do not need to register. The event will begin at 2 pm. Participants must enter the UN grounds through the Visitor’s Entrance on 1st. Avenue facing 45th Street. After going through the entrance, participants should go directly to the table where SPFII staff will hand out day passes to those who have registered. Day passes will be available at the table from 1 pm until 2:15 pm. It is essential that participants bring photo ID when picking up their day passes. Since Obama’s opening himself to the world – indeed a new America was born. This article provides two such new examples: the Jewish Japanese American breed and the undoing of the Latina concept as proven by the Sotomayor elevation to the point that we can say there never was really such a concept as Latina in the US. Japanese-Jew Doesn’t “Oy Veh” So Much Since Obama. As a Japanese-Jew, I have historically used self deprecating humor at my own expense as a way to explain and defend to others who I was and to feel accepted. Until recently I believed “everything” was my fault. But gratefully, since Obama has become president, not only do I feel more comfortable as the multiracial shikseh that I am, but engage in thoughtful conversations about my heritage and background, without jokes, defense or much self-deprecation. I only hope that I conduct myself with an ounce of the class, genus and moral fortitude the president has displayed when continually questioned about his cultural identity. I too was born in Hawaii and attended University High School in Hawaii a few years before Obama just a couple miles from his school, Punahoe High, whose students I shared long bus rides with from remote areas in order to get a good education; a value that my parents, like his, believed was invaluable. Like my mother and father, Obama’s parents are from two different cultures, yet he never feels the need to defend or justify his background, rather, he consistently responds to questions and assumptions with dignity and forethought. When asked during the presidential campaign what he considered his ethnicity to be, Obama answered simply that he is an American from two equally rich and diverse cultures. As a blend of cultures with a Jewish-Russian, Irish father and Japanese-Hawaiian mother, I too have faced continual questions as to what I considered my race, people, culture and ethnicity to be. I was given several names, including three middle names, all five on my birth certificate. One is named after my Jewish great grandmother, Beatrice, the other a Japanese name, Yukari, and the third, Caitlin, named after the wife of my father’s favorite poet, Dylan Thomas. My first name is named after a man — the Italian Renaissance painter, Piero Della Francesca, with his last name chosen for my first. Who was I, where did I come from, was I merely a mistake, an experiment, and how I might actually exist as a identifiable human — have been relentless questions that have sewn experiences throughout my culturally odd and unasked for politically patch-worked life. One searing memory I experienced involves a boy who told me on the schoolyard there was no such thing as a Japanese-Jewish person. Afterwards, I ran all the way home from this boy with the piercing blue eyes and looked into the mirror wondering if I really didn’t exist at all; at least in any real identifiable sense that mattered. This was just one comment amongst countless surreal exclamations that secured my stalwart allegiance to defining myself as a person from different cultures, but never defined by them. I can assume the President Obama has heard countless comments denying his existence as a fortified American as well, but was intrepid enough to remain an honorable candidate despite cultural ignorance on the part of others. This is the essential definition for any strong person; the ability, will and might to face oppression and hatred and march forward anyway. No one thought it was truly possible that a man who was Black may become president yet, no one. Some hoped, some feared, some dreamed, and many imagined a courageous, ambitious reality, but not one of us truly believed with full breadth that this young country was ready to make such a fearless and autonomous leap for the betterment of us and for the world. Like Obama’s parents, the marriage of my parents confounded some, upset others and was dismissed by the rest. My father was raised in Los Angeles and then attended The University of Hawaii not long after the bombing of Pearl Harbor. He came back with an education and a wife, who was a second-generation Japanese-American known as the Nisei generation, who grew up as a farmer on the coffee plantations of Kona, Hawaii. My Japanese-American uncles were part of the 442nd Infantry, also known as The Purple Heart Battalion, the most highly decorated fighter pilots in United States History. This includes some 4,000 Bronze stars and nearly 9,500 Purple Hearts. In this period, many Japanese-Americans were interned throughout the U.S, with land taken away, families torn apart and lives devastated, not unlike Jewish family members of my husband’s during the Second World War with more tragic results. A lot of anti-Japanese sentiment existed at this time, and yet my parents married, with whispers heard loudly as shouts and bombs from some family, while others chose to keep quiet with disdain; perhaps even more devastating. My parents had four children during the 1950’s and 60’s, and thankfully we were raised in Southern California, a region more liberal and tolerant of interracial marriage than many other parts of the country. At least as a writer, my life experiences give me more material to work with than my mother’s hundreds of antique kimonos combined with all the chuppah’s this side of Golden Gate Bridge. A perfect example of conflicting philosophies learned during childhood includes Buddha’s lesson that “Life as we know it ultimately leads to suffering,” while we were told simultaneously that although Jesus was indeed a suffering member of our tribe, we should never actually worship him. Surely President Obama must realize this profound effect he has had on a nation who soldiers so many different religions, races and cultures while speaking in native tongues more freely understood now at least now in spirit, if not yet comprehended in each syllable, syntax or inflection. And because we now have a president with a different story than president’s past, who holds his head high with his own proud blend of integral cultural being, each language and culture that is different is now more highly revered, as is each person’s individual journey. Each story sheds an even broader and brighter light on a nation that not only endures, but empowers; not only inspires but includes, and not only validates, but values each lesson, paragraph and infinitesimal anecdote that boasts the value of us all. This is now an axiomatic concept for the country, one that is only beginning to change America’s story and each person willing to tell their cultural rhythms on their own. For this one Japanese-Jewish woman who always thought she was strange; even once given the title of “Shikseh Princess” at a Bar Mitzvah by some nice Jewish boys, my story has now changed for the better and interestingly enough, still interesting all the same. Finally I can stop commiserating with Woody Allen when he said, “My one regret in life is that I am not someone else.” Except those rare moments when I begin to doubt the integrity and veracity of my own personal story that is just as valuable as anyone else’s. The doors for us all now open with greater ease and determination, and the answers and questions we hear on the other sides of each door are purely reflective of a nation that is now more unified in its diversity, and more open to discussion, depth, profundity and inclusion. The supposedly racial term was pushed by Nixon to lump distinct Spanish-speaking groups into one voting bloc. There’s no such thing, and the judge should be appointed on her merits. Here’s a good argument for putting Sonia Sotomayor on the Supreme Court: She’s knowledgeable, respected and deeply experienced. As a federal judge for nearly two decades, she’s heard thousands of cases and written hundreds of opinions. And here’s a lousy argument for confirming Sotomayor: She would be the first “Hispanic” on the court. I put the term in quotation marks because it’s a recent invention, dating to the 1970s and ’80s. Before then, when Sotomayor was growing up with her Puerto Rican family in New York City, she was not Hispanic. And words make a difference. As many commentators have reminded us since President Obama nominated Sotomayor, judges are inevitably shaped by their life experiences. But these experiences are themselves shaped — and, sometimes, distorted — by the terms that we use to describe them. How did Mexicans, Cubans, Puerto Ricans, Dominicans, Salvadorans, Panamanians, Nicaraguans and Guatemalans all become Hispanic? Amid the African American civil rights struggle of the 1960s, many of these groups joined hands to demand voting rights, bilingual education and social services. Here they received a big assist from an unlikely source: Richard Nixon. Eager to bring Mexicans and other Latino immigrants into the Republican fold, Nixon also saw them as a potential bulwark against black political aspirations. So Nixon threw his weight behind bilingual education, which has since become a bÃªte noire for the GOP. He also ordered the Census Bureau to add a query on its 1970 form asking whether respondents were “Hispanic,” hoping to further solidify this new voting bloc. Census Bureau officials balked, noting — correctly — that the term lacked scientific and historical precision. They also worried that respondents wouldn’t recognize it. So the most commonly used census form in 1970 asked respondents if they were of “Spanish” origin, not whether they were Hispanic. All that would change in 1977, when the Office of Management and Budget instructed federal agencies to classify Americans as one of four races — white, black, American Indian/Alaskan Native or Asian/Pacific Islander — and also to distinguish between two ethnic categories, “of Hispanic origin” and “not of Hispanic origin.” Since then, the census has asked people their race and whether they’re Hispanic, which is not listed as a “race” per se. Increasingly, however, Americans thought of it as such. Government agencies used “Hispanic” alongside “Asian” and “black,” making Hispanic into a de facto racial category. Businesses and educational institutions counted Hispanics — or, sometimes, “Latinos” — as a race in diversity and affirmative action reports. Not surprisingly, then, Hispanics became more likely over time to identify themselves as a separate race too. In the mid-1990s, 60% of the respondents to a study of more than 5,000 Latin American immigrants self-identified as “white,” for example, but only 20% of their children did so. That’s an unprecedented development, as the United States had continuously absorbed people formerly identified in the census as from nonwhite races into the white majority. Jews, Italians and Slavs were all once classified as separate races; now, they’re white. But Hispanics are moving in the opposite direction — from white to nonwhite. In our minds, at least, they’ve become a minority race. The language of race is a unifying one, blinding us to the irreducible diversity that a single category can contain. Consider Sotomayor’s now infamous comment that a “wise Latina woman” would render a better judicial decision than a white male. While GOP antagonists accused Sotomayor of reverse racism and Democrats rushed to her defense, nobody pointed out that wise Latina women come in all shapes, sizes and ideologies. Would a wise Cuban woman in South Florida see eye-to-eye with a wise Mexican woman in San Diego, or with a wise Salvadoran woman in Washington, D.C.? Probably not. Even worse, the idea of race tricks us into seeing “Hispanic” as a biological category rather than a cultural one. I frequently do an exercise with my students, asking them how a scientist would identify their race. The most common reply is also the most troubling one: via a blood test. In fact, that would tell you the opposite: We all come from the same ancestor, in East Africa, and we’re all mongrels. The blood test does not identify your “race,” which primarily exists only in our minds. As a child, Sotomayor was probably classified as white; now she’s Hispanic. But her DNA is the same. The only thing that has changed is the way we look at her. Belying every shard of evidence, we continue to believe that races are different under the skin. If you think the words don’t matter, you haven’t been listening.